The Spanish League, LaLiga, will on Friday, open an office in Nigeria as part of the implementation of the technical and commercial partnership recently signed with the League Management Company. 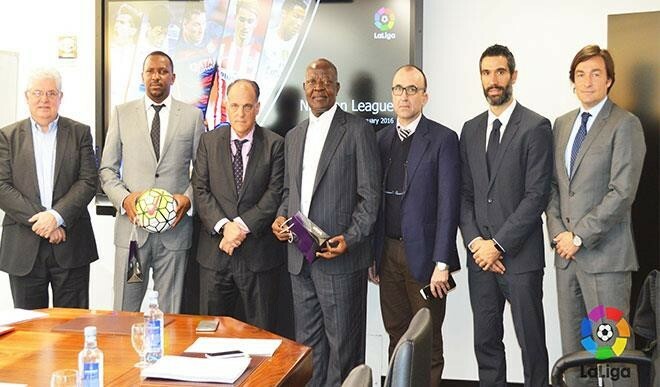 Shehu Dikko, the Chairman of the LMC, disclosed on Wednesday that the LaLiga office in Nigeria is situated inside the LMC office in Maitama District in Abuja and that the LaLiga President, Javier Tebas, will be in Nigeria to personally commission the office. Dikko described the coming event as another major milestone in the partnership between the Nigeria Professional Football League and LaLiga, coming before the NPFL All-Star LaLiga tour coming up in August. “We are delighted that very early in the tenor of this partnership, a lot of positives are being yielded. This opening of the LaLiga Office represents another landmark in the partnership and will facilitate effective collaboration between the two leagues,” remarked Dikko after inspecting the installation of equipment in the office. Ahead the event, Antonio Baradas, the LaLiga Africa Representative based in South Africa, is already in Nigeria working with the LMC for finer details of the event plan. It will be recalled that LaLiga Foundation, a charity arm of the LaLiga, recently announced a grant of 56,000 Euros and equipment to El-Kanemi FC to support the club in response to the insurgency that forced the club to play home league fixtures in other cities for almost three seasons. A squad of the NPFL best players selected into an All-Star team are already in camp preparatory to a tour of Spain where they will participate in the prestigious Carranza LaLiga World Club tourney and also in a friendly match against Valencia CF. Nigeria is the second African country after South Africa to have an office of a major European League and LaLiga President, Tebas, was in India recently where he announced that a LaLiga office will be opened in that Asian country.